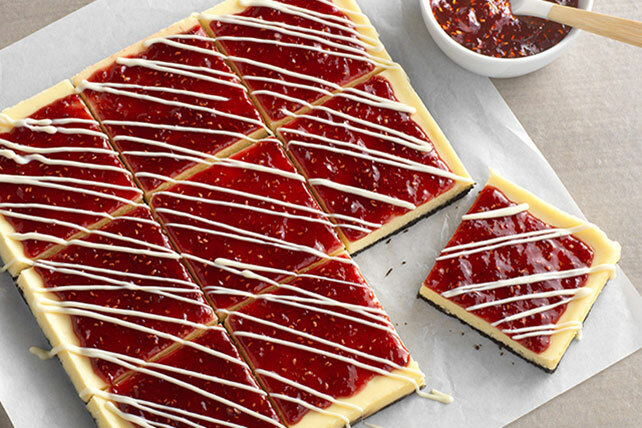 Combine two great flavors for White Chocolate-Raspberry Cheesecake Bars. The OREO crust makes these White Chocolate-Raspberry Cheesecake Bars more divine. Line 8- or 9-inch square pan with Reynolds Wrap® Aluminum Foil, with ends of foil extending over sides. Mix cookie crumbs and butter; press onto bottom of pan. Melt 2 oz. chocolate as directed on package. Beat cream cheese, sugar and vanilla in large bowl with mixer until blended. Add melted chocolate; mix well. Add eggs, 1 at a time, mixing on low speed after each just until blended. Pour over crust. Bake 25 to 28 min. or until center is almost set. Cool 5 min. ; spread with preserves. Melt remaining chocolate; drizzle over cheesecake. Cool cheesecake completely. Refrigerate 4 hours. This recipe can be easily doubled. Prepare as directed, doubling all ingredients and baking in 13x9-inch pan. Makes 18 servings.